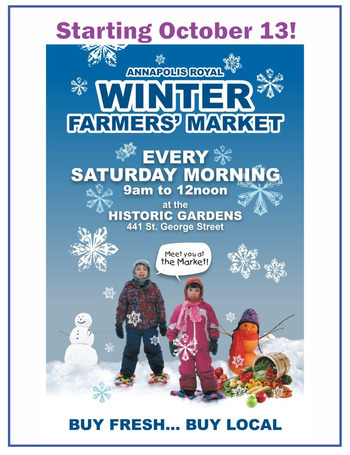 While many communities cannot boast of having even a summer Farmers Market, the small Town of Annapolis Royal can be very proud that it has a blossoming year round Market presence. The renowned summer Market is one of the largest outdoor markets in the Maritimes – a resounding success story for more than 35 years. The Winter Farmers Market, while much younger, has been thriving since 2008 at the Historic Gardens. Organizers of both markets like to think of it as One Market in Two Locations – downtown in the summer months and at the Gardens in the winter. Whatever way you look at it, together these two Markets provide seamless year round access to local food products, drawing customers from far and wide. Another feather in Annapolis Royal’s cap, and a testament to the support of the local community for their farmers and food producers.